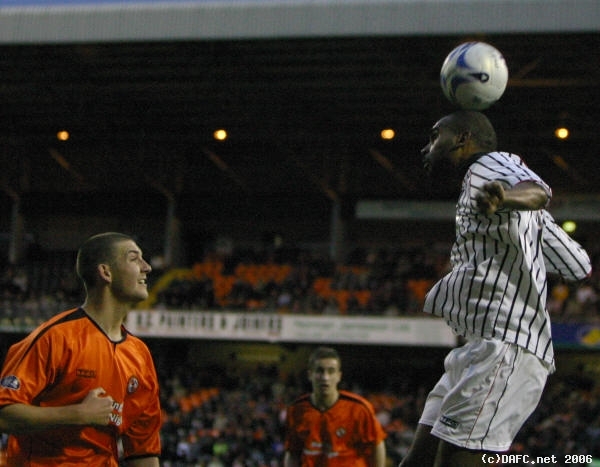 Pars visited Tannadice on their last away outing of the season in buoyant mood after a couple of good wins and securing SPL football for next season. The story of United before the game was about injury lists and young players, but there was no doubt that they dominated in the first half. The Pars, who should have been looking to leapfrog United and Falkirk with this game, seemed at first to be the less interested in taking the three points. The second half was to prove different however, with a lucky black cat and a Daquin goal which gave the Pars their first three game winning run since 2003. The Arabs won seven corners in the first forty-five, with six shots in total, half of which were on target. McGregor was forced to save each one as he reacted quickly to a close quarters header from Samuel on six minutes. The same striker forced saves out of him again in the fifteenth and thirty-second minutes. 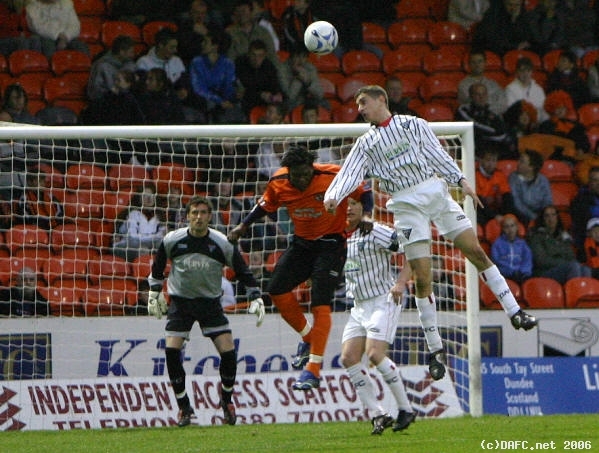 Pars` first opportunity came when Kenneth misjudged a passback and handed the ball on a plate to Burchill. He hit his shot well and on target, but Samson was up to the task and Pars related excitement returned to its former flatline state. Pars` only other on target shot of the half came from the unlikely Ian Campbell, as he latched onto a ball some way out of the box and won the Pars only corner by hitting the defender in front of him, as his dad watched from the stand. The first half died away with neither team having taken advantage, and the three points still up for grabs. Pars grew into the game in the second half, playing the ball more on the deck and Daquin became more involved in affairs too. United`s chances still came and Mulgrew sent a rasping shot just wide of the post in the fifty-first minute. Most efforts from both teams were weak and wide. Fernandez found himself sitting down in the box in the 67th minute with howls for a penalty, claiming that he was interfered with by Mason. The referee was having none of it. With only a few minutes remaining of United`s last home game a black cat ran the length of the pitch, providing the biggest cheer of the night. Had the United fan`s looked carefully though, they would have seen that the cat was in fact black and white, and in minutes Daquin had found himself on the end of a ball which the United defence failed to clear. He hit it with his left and Samson had no chance of stopping its progress towards the back of the net. He disappeared under a pile of bodies. Both teams huffed and puffed a little after that, but the points were destined for East End Park. A more than welcome result, which lifts the team, at least for the moment, into ninth place.